World War II was the greatest armed conflict in history, and Tennessee played a significant role in the Allied victory. Over 300,000 men from all parts of the state served in America’s armed forces and six were decorated with the nation’s highest award for valor, the Congressional Medal of Honor. 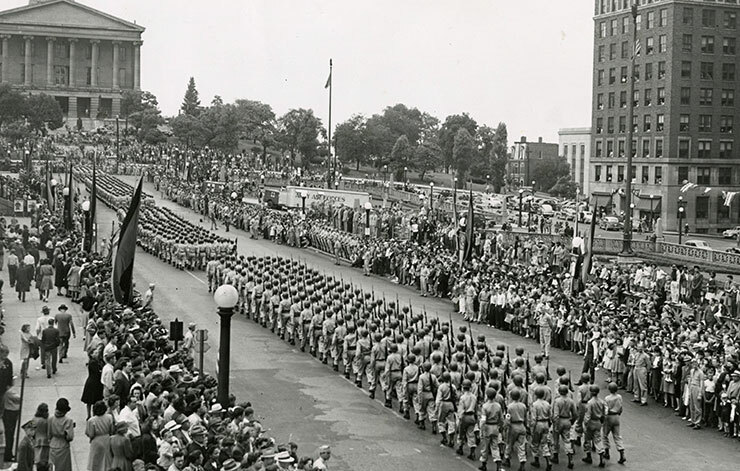 After touring Europe in 1937, Governor Prentice Cooper believed that if hostilities broke out that it would only be a matter of time until the United States would have to enter on the side of the Allies. Cooper had the prescience to prepare Tennessee for war by developing the necessary infrastructure for military bases, training, and war-related industries. In 1940, Tennessee was the first state to establish a defense organization, the Advisory Committee on Preparedness. In June 1941, Middle Tennessee was chosen as the location of the first of a series of military maneuvers that featured the combined forces of tanks and infantry, largely because its geography was similar to that of Western Europe. In these maneuvers, General George S. Patton, who led the 2nd Armored Division, and who would become one of America’s greatest battle commanders, refined his innovative tactics for the aggressive use of tanks that was to become his hallmark. Throughout the war hundreds of thousands of soldiers trained for the effort at Camp Campbell (now Fort Campbell) near Clarksville, at Camp Forrest near Tullahoma, and at Camp Tyson, near Paris, Tennessee. These installations also housed thousands of Axis prisoners. Tennessee also helped to usher in the Atomic Age when Oak Ridge was chosen as one of the main sites for the top-secret Manhattan Project. The enriched uranium produced there was used in the atomic bomb dropped on Hiroshima. This bomb and a second one dropped on Nagasaki ultimately ended the war. The materials cited in this guide are only a sampling. Please consult with reference staff for additional materials. The Balch Family Papers, 1780-1996, contain items that focus on the Balch, Windrow, Espey, Hembree, Covington, and Hawkins families. Items regarding World War II are related mostly to Ben Clay Espey, who served with the 15th Air Force. Microfilm 1886. The Sallie Gray Brown Papers, 1918-1945, consist primarily of World War II letters received by Sallie Gray Brown (Mrs. Charles B. Brown) of Gallatin. Mrs. Brown was active in the U.S.O. and corresponded not only with servicemen from the area but also with those who had participated in maneuvers near Gallatin. A few other World War II-related items are also included in the collection. Microfilm 1465. The Byrd Douglas Family Papers, 1819-1968, is an important collection for students and scholars of river commerce and for those interested in steamboats and other maritime vessels. Within the collection is a photograph of a WWII mine-sweeper. Microfilm 1547. The Robert Coy Scrapbook and Yearbook, ca. 1942, contains many loose photographs of the camp which was the headquarters for the 306th Coast Artillery Barrage Balloon Battalion, Barrage Balloon Training Center. Unprocessed. THS 763. The Combs L. Fort Papers, 1862-1983, chronicle Mr. Fort’s service in the military during World War II and on the Mt. Olivet Confederate Memorial. The Air Raid Warden information materials are centered on Mr. Fort’s time as a warden in Nashville. Included is a handbook for wardens, blackout instructions, a manual for civil defense, pocket guides to common war gases, and a list of all the Air Raid Wardens in the 21st Ward, Zone #11, in Nashville. Materials included are correspondence, official documents, booklets, military manuals, induction records, magazines, and photographs. Microfilm 1823. The Gladys McDow Hibbett World War II Scrapbooks, 1939-1945, consist of seventeen scrapbooks compiled by Mrs. Hibbett. They begin in 1939 and conclude with the end of the war. They are composed primarily of cartoons and photographs together with some clippings and memorabilia. The materials were obtained from newspapers, magazines and pamphlets. All persons who attained any importance or notoriety during this period are almost certain to be represented. The cartoons are particularly interesting. Pictures of Franklin Roosevelt, Winston Churchill, Adolf Hitler, Joseph Stalin, Eisenhower, Montgomery, and numerous others in various phases of their careers are featured in these volumes. Microfilm 1248. The “Home Front Tennessee” World War II Project Records, 1933-1995 collection consists of a small number of items including newspaper clippings, memoirs, recollections, etc. Microfilm 1881. See also “Home Front” World War II Oral History, 1991-1993, which consists of questionnaires, 5 audiocassette interviews, and thirty videotape interviews. The Lyle B. McLevain Papers, 1942-1985, recount McLevain’s service as a guard at a German POW camp near Bolbec, France, during World War II. The collection consists mostly of photographs taken in Europe during the war. It also contains correspondence, pamphlets, and postcards. Three letters are from Mama Juliette, a French civilian whom McLevain befriended during the war. In Helmuth B. Veucht’s letter of Hohwald, Germany, dated May 31, 1946, Feucht thanks McLevain for his help during captivity and describes the conditions in Germany after the war. Also included is a pamphlet regarding Camp Philip Morris and postcards from Europe. Microfilm 1874. The Hardy A. Mitchener Diary, 1944-1945, is a unique journal of Mitchener’s captivity in a German prisoner of war camp. Mitchener was a 2nd Lieutenant in the 509th Bombardment Squadron, 351st Bombardment Group, 8th Air Force, stationed in Polebrook, England, during World War II. He was shot down and captured on May 30, 1944, after a bombing mission in Oschersleben, Germany, and sent to Stalag Luft III shortly thereafter. During his stay at this POW camp in Sagan, Germany, known principally for the famous “Great Escape” that took place in March 1944, Mitchener kept a diary of his experiences. The diary contains detailed drawings of life at the camp as well as documentation of the prisoners’ rapid evacuation on January 27, 1945. Mitchener was fond of writing songs and poems in his diary, and includes numerous examples of works that speak to the prisoners’ depression, boredom, frustration, and overpowering desire for freedom. Microfilm 1746. The Tennessee Historical Society World War II Collection, 1941-1945, contains approximately 2,000 items, consisting of clippings, lists, photographs, press releases and miscellaneous items. The bulk of the collection consists of clippings which cover a wide range of topics: an appeal for binoculars; “E” Awards; Jean Faircloth MacArthur; Millington Naval Air Station (Memphis, Tennessee); military families; naval personnel both men and women; recruiting for the WAVES; Merchant Marine lists (casualties, deaths, and prisoners-of-war); and radar. There are twenty-four folders of naval personnel (men) arranged from A-Z and twenty-four folders containing clippings about the WAVES (Women Accepted for Volunteer Emergency Service). Microfilm 1105. The World War II Naval Personnel Biographical Data Collection contains biographical data and other information on citizens of Tennessee who served in the United States Navy during the Second World War. The information contained in this collection is divided among enlisted personnel, officers, specialists, and WAVES, and dates from the years 1943 to 1945. Some individuals listed in these biographies have Arkansas addresses, and it is assumed that during some part of their training they were stationed at the U.S. Naval Station in Memphis. Some of the biographical information is incomplete, and many more Tennesseans served in the U.S. Navy in the war than are represented in this collection. Aside from the biographical sketches are newspaper clippings on recruitment of female Tennesseans for service in the WAVES. Many of the biographical sheets contain photographs of the individuals. Microfilm 1305. The Yeatman-Polk Collection, Addition, 1934-1955, contains approximately 900 items, and spans the period 1934 to 1955 concentrating on the World War II experience of T.P. Yeatman, Jr., the early teaching career of Nancy McDearman, and their eventual marriage. Clippings, correspondence, newspapers, postcards, photographs, and printed materials comprise the collection. Microfilm 1118. See also the Yeatman-Polk Papers, 1804-1970, which contains 1,081 letters by Mary Yeatman written between 1899 and 1968, predominately to members of her family and friends that mention politics, economic conditions during the Great depression, Franklin Roosevelt’s New Deal, and World War II. Tennessee World War II Veterans’ Survey, 1996, Record Group 237 is divided into five series: Series I contains approximately 7,500 completed questionnaires arranged alphabetically. Series II consists of photographs, copies of veterans’ discharge/separation papers, diaries and memoirs, clippings, books, and related military service materials. Series III contains donor agreements which transfer ownership of supplemental materials to the Tennessee State Library and Archives. Series IV is the office files of the project coordinator. Series V has a small file of World War II questionnaires from an earlier survey. The Tennessee World War II Veterans’ Survey provides a valuable source of information for historians, researchers, and genealogists. World War II Salvage Commission, Tennessee State Salvage Commission Committee Scrapbooks, 1942-1943. Record Group 286, consists of four large scrapbooks, arranged in chronological order, of newspaper clippings from across Tennessee chronicling promotional efforts and results of scrap drives to help the war effort. The booklet, "Plan for Salvage Operations and War on Waste," gives a detailed outline of how local communities could set up effective committees to guide the collection of metal, rags, rubber, and paper to be used to supply troops in the war effort. Microfilmed. Secretary of State, Division of Elections, Military Absentee Ballots 1944-1962. Record Group 125, consists of one hundred four volumes of registers from the Tennessee Department of State. All counties of the state are listed by volume and each volume is indexed. Microfilmed. The Russell Walther Diary, December 7, 1941-May 8, 1942, U.S.S. Lexington, details the daily events aboard the aircraft carrier U. S. S. Lexington from the day of the Japanese attack on Pearl Harbor through May 8, 1942, when the Lexington was sunk in the Battle of the Coral Sea. Microfilm 954. Map of the “Atlantic Arena” as of May 10, 1942, shows the supply lines of the Allies, and the political divisions and allegiances of countries associated with these supply lines. Map appeared in the 1942 issue of Fortune magazine. Map #2749. Map published by the U. S. Geological Survey, shows the boundaries of the war maneuvers of the U. S. Army during exercises held in Middle Tennessee. Map #2839. “Newsmaps for the Armed Forces,” a weekly series of maps and text describing the progress of the war beginning April 27, 1942, through 1946. Prepared and distributed by the Army Information Branch. Unprocessed.